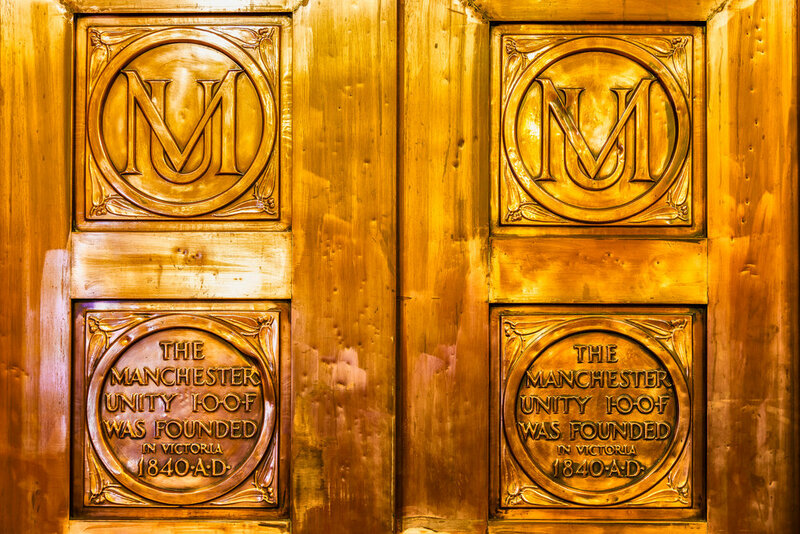 The detail on the door of the lift at the magnificent Manchester Unity Building at 220 Collins Street, Melbourne. Wandering around the Melbourne CBD I found myself inside the spectacular Manchester Unity Building at 220 Collins Street. Famous for housing dentists and jewellers the building has seen more than its fare share of action over the years. Smack bang in the middle of the city is not where you’d expect a brazen heist or murder to occur. But that’s part of the history of one of Melbourne’s most iconic buildings. The above photo was made on the ground floor and features a detail from one of the lift doors. I was drawn to the vibrant copper and golden colors and to the beautifully designed logos embossed onto the door. So, as you can see, this is a quite straight forward documentary photograph. Yet, with careful attention to light, composition and image processing it’s certainly possible to bring out the beauty and mystery in the everyday. What Choices Underpin How Your Photos Look? I employed Adobe Lightroom for the basic processing of this photo and then brought the image into Photoshop to enhance the detail and bling already present in the door. There’s so much more I could have done, and this image could easily be pushed from metal detail into flowing plastic. But I prefer making relatively realistic images that, while grounded in reality, explore the sublime beauty on the edge of our everyday experience. Once you achieve a level of confidence in your ability to make a good photo it's worthwhile spending some time thinking about the images you make. How would you describe your approach to making photos? What are you exploring or communicating through the photos you make? What post-processing preferences seem to appear in your best images? You are full of untapped talent and potential. But, before you can properly explore your creativity you first need to know how to use your camera. It should be a passport, not a barrier, into the world around you. Perhaps it’s time you considered taking one of my Private Photography Courses. After just three hours you’ll be able to master the fundamental principals (i.e., Shutter Speed, Aperture, ISO, Exposure, Focus and Depth Of Field) underpinning your camera and be on your way to making great photos. With practice a new confidence will arise and a more creative outlook and approach to your photography will be unleashed. If you live in or around Melbourne, Australia you'll want to check out the Special Price above. But remember, it's only available for a limited period of time. I hope to work with you soon. If you have any questions feel free to Contact Me directly.